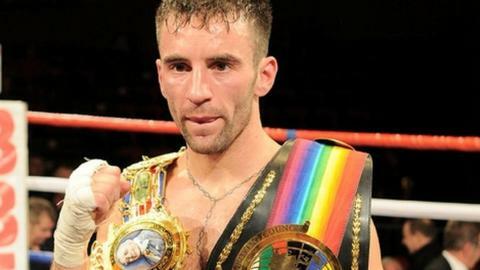 Lee Haskins has booked a place on the same bill as Tyson Fury for his European bantamweight title fight. Haskins hoped to stage his contest with Stuart Hall in his home town of Bristol but a venue could not be secured. He will now appear in the 10-fight show at the Hand Arena in Clevedon, Somerset on Saturday 7 July, along with British heavyweight star Fury and Chris Eubank Jr.
"It's going to be exciting," promoter Jamie Saniger told BBC Radio Bristol. Lockleaze-born Haskins has not fought in Bristol since 2007 and, after winning the purse bids for the fight, Saniger spent a number of weeks searching for a venue in the city. He continued: "Unfortunately we couldn't find anywhere centrally located in Bristol. We searched high and low but nothing suitable. "But I think we've come up with a great solution at the Hand Arena. It will be an opportunity for not only Bristol fans but those in Somerset as well." And Saniger is delighted Haskins is included on the same fight card as highly-rated Fury: "Tyson is the name on everybody's lips. "He's exciting to watch and I'm sure it will be no different this time." Haskins was originally due to fight Stephane Jamoye for the vacant title but injury forced the Belgian to pull out. Haskins will now take on Hall - a former British bantamweight champion - in front of an expected 2,500 crowd in a contest which could be a stepping stone to a world title fight for the Bristolian. "Hall is a tough, rugged fighter so it's going to be a tough fight," added Saniger. "We've got four weeks to work on training and tactics and we're just really looking forward to it."